Little Spurs Pediatric Urgent Care, Bandera is a pediatric urgent care center serving the children, adolescents and young adults in San Antonio with extended hours, making them a great option 7 days a week when your child's primary care office may not be open. You can find this clinic located at 11398 Bandera Rd, Suite 201 and patients can walk in to see them today from 9:00am to 9:00pm (last verified on 2018-08-10). Recognized favorably amongst their patients, Little Spurs Pediatric Urgent Care, Bandera has an average rating of 4.6 stars out of 5 based on 231 total ratings. 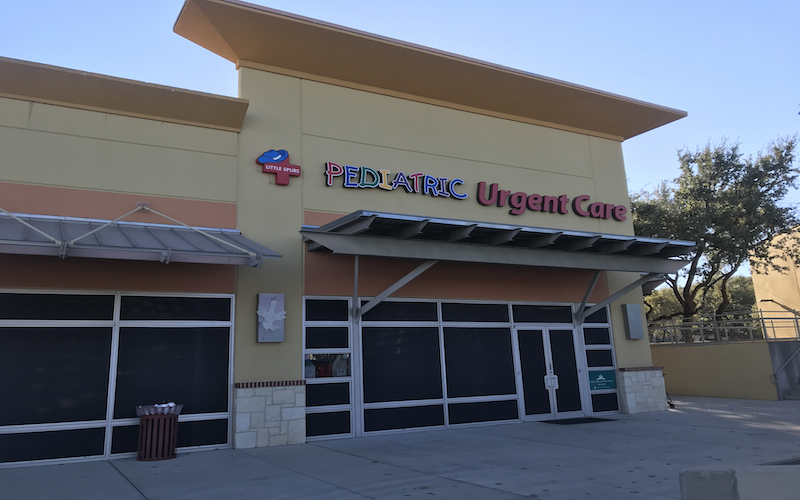 Nationally, most pediatric urgent care patients see average wait times between 15-30 minutes before being seen by a provider, which should be expected at Little Spurs Pediatric Urgent Care, Bandera as well. Love of the staff especially Tai and the doctor. My little one always gets nervous seeing his regular doctor but not here. Staff was excellent as always! Wonderful! Great experience! Amazing clinic! This crew has come through for my family more than once when it was impossible to get into our primary. The staff is welcoming and thorough. I appreciate the convenience and professionalism. I logged into the app very early to get my son a place in line. When we arrived, the check in itself was fine. I was able to monitor how many people were in front of us. We were next in line when another patient was called. When I asked the front desk why, they said she had been waiting a while and that’s why they moved her in front of us. What is the point of doing the app and holding your place in line if you’re going to choose to put other people in front of the person who took the time to do the online?? Was not fair or appropriate in my opinion. Great experience! No appointment and I didn’t wait more than about 2 minutes before my daughter was seen. Amazing! Perfect with my son. Will definitely be back. Very quick in and out. Caring, and patient staff. It was quick and they checked over everything thoroughly. Will come here again if we need the doctor after hours. Very satisfied with the service !!! I was in and out in under an hour, thanks little spurs!